You can only patch a leak so many times, or catch rainwater in a pan for so long. At some point, you need to take steps to fix your roof for good. That’s the daunting situation the people at McGill Facilities and Operations and Development faced over the deteriorating terrace between the McLennan and Redpath Libraries. You can only patch a leak so many times, or catch rainwater in a pan for so long. At some point, you need to take steps to fix your roof for good. That’s the daunting situation the people at McGill Facilities and Operations and Development faced over the deteriorating terrace between the McLennan and Redpath Libraries. The terrace, which runs between the main entrance to McLennan and the long east side of the Redpath, serves as the roof for the spaces beneath it and a pedestrian walkway at the same time, providing a panoramic view of Lower Campus along the way. Over the years, however, cracks have developed in the concrete blocks and stone pavers that make it up. For many of those years, rainwater was prevented by from infiltrating the spaces beneath by a waterproofing membrane installed immediately beneath the roof. 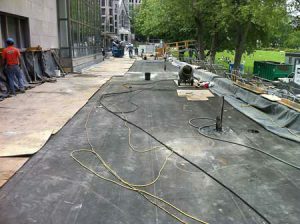 But once the membrane, which dates back to the late 1960s on the McLennan portion of the terrace and the early 1950s on the Redpath side, starting breaking down, water infiltration became a chronic problem that threatened to damage library areas, including the newly renovated Cybertech space in the basement of Redpath Library. Temporary fixes over the past 20 or so years included multiple patch jobs and the installing of water collection pans in the ceiling of the Library’s Cybertech study zone. The situation came to a head in 2010, when Facilities and Operations and Development staff uncovered the extent of the damage to the roof and membranes. The decision to completely rebuild the vast terrace as well as the walkway and staircase that connect it to McTavish St. was soon taken. Phase 1 of the three-year, three-phase $6.8 million project was completed in the summer of 2011 with the rebuilding of the exterior walkway and staircase between the two libraries. Today, contractors are more than halfway though Phase 2, the reconstruction of some 900 square metres of the southern half of the terrace and its substructure. To deal with rainwater, a thicker granite pedestrian deck is being installed to allow for positive drainage slopes under the decking to draw water off the new membrane more effectively. To cope with and collect that water, an underground storm-water retention tank has been also incorporated into the construction plans. The tank, which will be situated beside the southwest corner of Redpath Library, will retain all the water that falls on the terrace from Redpath Hall to McTavish Street. A portion of the collected water will be used to irrigate the shrubs, grass and plants along the pedestrian zone of McTavish Street. 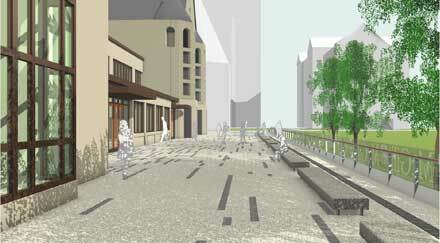 An illustration of what the completed terrace will look like after Phase 3 is completed next year. rail, a green space in the wide part of the terrace near the McLennan entrance, and benches made from the slabs of granite that now cap the low wall that runs the length of the entire terrace. Another challenge during the first two project phases has been the managing of access to the libraries and other work spaces and limiting other disruptions to students, faculty and staff while work was underway. This summer, staff and students wishing to access the buildings had to walk around Redpath Hall and enter through the main Redpath Library doors on the open part of the terrace. Library staff were also permitted to access their work areas through the Service Point entrance on McTavish St. before opening hours, which saved some of them a lot of walking in the morning. As for putting up with the noise that comes with a construction project of this magnitude, students and library staff were offered earplugs, and the construction team saved their noisiest work for mornings. Similar circulation re-routings and door closures will be in place when Phase 3, the completion of the remaining half of the terrace, gets underway next summer. There will be no direct access to the Redpath Library (or Redpath Hall) via the terrace. Instead, access to the libraries will be through the main doors of McLennan. Normal access and circulation will return to the area between phases 2 and 3. For more information on the McLennan-Redpath Library roof terraces project and other major campus construction projects, visit www.mcgill.ca/construction/. Should your readers be interested, we wish to mention that we are the architects of this project. We have also had the honour of doing several other projects at McGill University, including the Cybertheque Project, the McGill Service Point, the Stewart Biology Roof Terrace, the current Strathcona Anatomy and Dentistry Project and others. All three partners are graduates from the McGill School of Architecture.